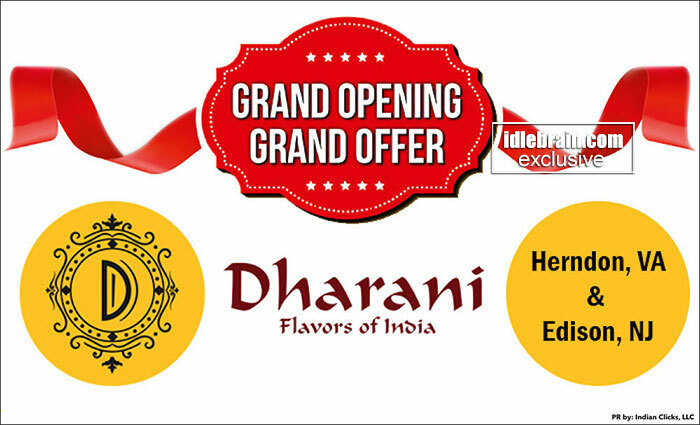 Dharani to launch a chain of consistent high quality Indian restaurants in New Jersey and Herndon, VA.
Dharani brand was born when a bunch of passionate process and quality-oriented minds collaborated with a team of chefs with strong culinary background. Dharani is one of the rare Indian restaurants that established dedicated food research and innovation facility in Massachusetts by hiring internationally renowned chefs to create and perfect the dishes that gets offered at all Dharani locations. Now, Dharani, a national brand that partnered with local investors, who are passionate to provide consistent quality flavorful Indian food, and is ready to open multiple dine-in and take out restaurants in New Jersey, staring with three locations in Central New Jersey and Herndon, VA.
After reviewing several brands, the team has decided to go with Dharani, an established culinary success in New England in the north and North Carolina in the South. The goal of Dharani is to provide high quality Indian cuisine, that is consistent every time, clean, flavorful and at a reasonable cost. Dharani NJ and VA management team emphasized that “Our goal is different than lot of other Indian restaurants. We are focused on customer experience. We realize that people have a choice in selecting where they want to eat. When they come to Dharani, they will encounter the same consistent flavored food every time that is made with freshest ingredients in the market”. The Dharani team is focused on making customers feel at home from the time they enter the restaurant to the time they leave. They will be taking constant feedback from the customers and make appropriate changes to enhance taste and experience. Management takes every customer feedback very seriously and established SOPS for continuous improvement in what the restaurant offers and serves. CEO of Dharani chain of restaurants, Mr. Bhasker Rednam, said “My team is very excited at this opportunity to bring our time-tested recipes to New Jersey and Virginia. We have successful operations in many locations in the northeast and with expected success in New Jersey and Virginia, we will expand our operations in to other areas. We are customer focused and we will remain customer focused. We take on the challenge to cater to our customer needs with pride, to provide cuisine from any part of India”. Everyone at Dharani is trained from chefs to wait staff to ensure a consistent experience. Very soon Dharani will be offering Some unique specialties like Meat Haleem, Veg Haleem (a new flavor that has never been tasted by any), Nizam Goat Dum Biryani, Irani Chai and Irani Samosa along with existing specials Chicken Sukka, Nellore Fish Pulusu, crab curry. Dharani is fully equipped and experienced to cater to parties of up to 5,000 people. Grand launch of Dharani at two locations in New Jersey are scheduled for March 24th; one in Edison on Oak Tree Road and the other one in Dayton on March 31st followed by Spotswood, NJ in few weeks. The Herndon, VA branch opened last month. An initial discount offering for customers visiting the new locations for the first four weeks will be an ideal time for everyone to go and try. Dharani strongly believes and stands by the product it offers hence confident that once you try our food, you will become one of our loyal customer base. We once again thank all our loyal customers who made this new launch possible with their continuous support.